On August 29th 2016, a celebration of the 70th anniversary had happened with Ideal Logistics Solutions. At this event, all employees and their families was conveyed to a special casual day! Organized under a funny formula with family activities. Tractor’s tours, animation, meal and fire eater was part of the party! Ideal Logistics Solutions, family company since 1945 through 4 generations, offer supply chain services as pick and pack, warehousing, transportation and logistics. Over 110 employees in Quebec City and Montreal, a business modal to follow! 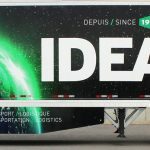 Great Kick-Off for Ideal Logistics Solutions!